The set-up for Collateral Beauty is that a New York advertising agency is facing tough times with a major client on the brink of walking away and the two partners need to make some decision. Trouble is that the one with the controlling share is grieving for his child who died two years ago and only seems to appear in work to set up crazy domino chains. Whit (played by Edward Norton) together with colleagues Claire (Kate Winslett) and Simon (Michael Peña) decide to stage an intervention. Three local actors (Keira Knightly, Helen Mirren and Jacob Latimore) are engaged to interrupt the life of Howard (Will Smith) and either knock him back into the real world, or give them the evidence they need to prove that he is not competent to vote with his 60% share of the business. Three advertising abstractions – love, time and death – are at the core of the plot and Howard’s sorrow. But these are also crucial issues with which Whit, Claire and Simon are coping badly in their own personal lives. The scheming Helen Mirren and in-your-face Jacob Latimore are two of the most interesting characters in the film which often seems to rely on tears rather than solid acting to manipulate an emotional response. It could be a great short story and the twist near the end shows signs of a polished script. (The final twist spoilt the ending for me.) The parallel suffering and symmetry mean that it could be adapted for theatre where the plot holes would easier to forgive. The soundtrack is light and the film enjoys some very classy cinematography. However, there are a great many things that don’t work about this movie. The hefty cast is so star-studded that it becomes very distracting every time another well-known face pops onto the screen. It’s set at Christmas time, but that has no bearing on the plot. Movie plots are full of coincidences. But this one requires a bicycle to be abandoned, a subway to be caught, and a particular exit to be used … a feat that local mentalist David Meade might even struggle to implant in Howard’s mind. The translation from script to screen is very unsubtle. Howard’s penchant for cycling against the flow of traffic wears very thin. If the dominos are supposed to be a metaphor for life-long journeys that cannot be changed or controlled then the mundane filming of the multiple sequences of collapsing plastic pieces fails to ignite much imagination. The concept behind the film’s clunky title is poorly explained within the film and that it underlines its weakness. Beauty may indeed exist in the deep pit of loss that grieving parents find themselves trapped in. But when did ‘collateral’ seem like an appropriate word to prepend to the title. ‘Broken Beauty’ might have worked better. It’s not Ghost. It’s not Crazy People. And it’s no Love Actually. 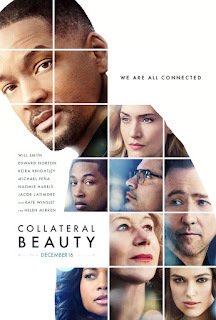 Instead Collateral Beauty is a Christmas turkey of a film that needs to be seen to fully explore how such a great slate of actors could create such a weird movie. And that’s clearly why it has been released and will be successful at the box office. So many cast members will attract their following to cinemas. Hopefully they’ll find some ‘collateral beauty’ amongst the dominoes. Collateral Beauty will be screened in Movie House cinemas from Monday 26 December.